The main purpose of Nebulizer unit is to atomize the essential oils and then quickly circulate the fragrance of the essential oil into the air. The three main components of the Nebulizer are, the bottom, the Nebulizer, and the pump for diffusing the oil into the air. The air pump is basically used to send the compressed air out to spray the area in the room. A Nebulizer is usually made up of materials like, glass, porcelain, metal, plastic or wood. How does the nebulizing diffusers function? Once the Nebulizer is turned on, the air pump launches the condensed air through a tube in the pump in order to direct the course of the oils. Then, a flow of air, comes out of the nozzle’s tube creating a vacuum. This vacuum absorbs the mixture of water and oil from the Nebulizer’s bottom feeding tube to the top of the feeding tube. Now, the air blows all over the surface of the feeding tube of the oil at the top of the container. Then, the oil hits within the glass of the Nebulizer. In most of the high quality Nebulizer, they usually have very small nozzles for spraying the oil. The size of the holes is usually between 0.3 to 0.4 mm. Thus, this system of the Nebulizer enables it to disperse great amounts of oils to saturate the air with fragrance very rapidly. 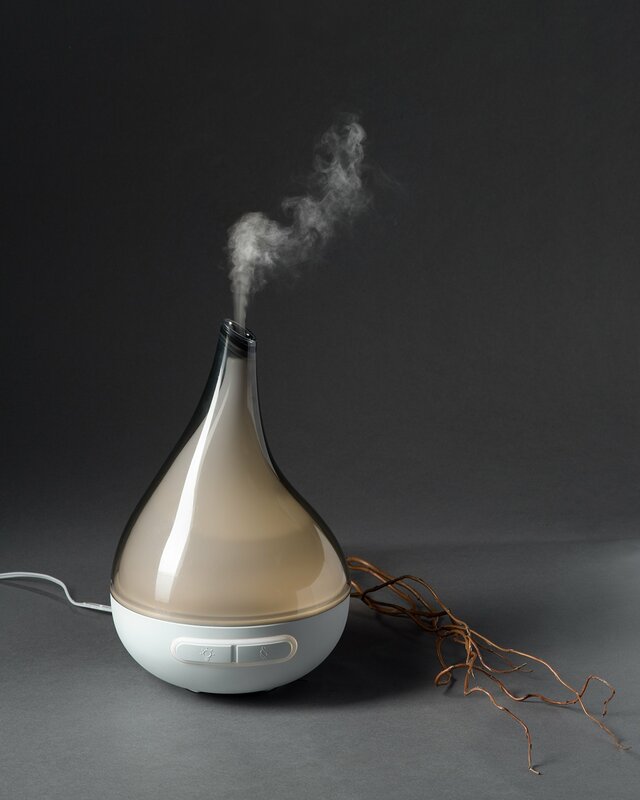 Nebulizer Essential Oil diffusers are mainly known for their therapeutic value. These diffusers show instant effects and provide quick relief from different types of lung problems. It instantly makes the environment cool and creates a relaxing and soothing ambience. There are various types of Nebulizer Essential Oil diffuser available in the market. But, you will have to be careful, so that, you can choose the effective ones. Here is a list of top five diffusers for essential oils, which will guide you to choose the right diffusers for essential oils for you. The ZAQ Dew Essential Oil Diffuser LiteMist Ultrasonic Aromatherapy has an eighty milliliter water capacity and are available in various colors like white, black, turquoise, and green. The shape of the diffuser is like a rounded pyramid. The atomizer is in the top hole, which is used for spreading the aroma into the air. It is energy efficient in nature and the diffuser can run for up to four hours at a stretch, before you will have to refill the reservoir with water. 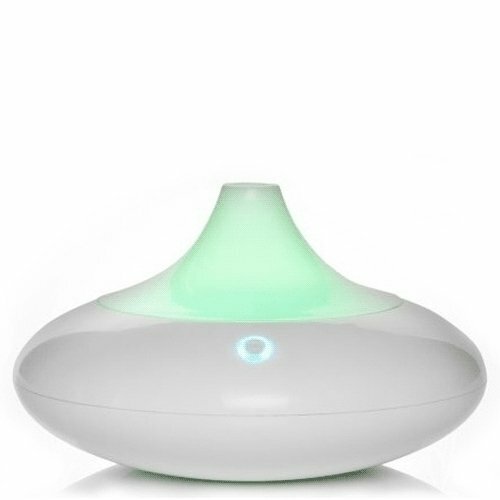 You can use this diffuser anywhere in your home, including bedroom, child’s room, bathroom, office room, massage parlor, spa, or anywhere you want a lovely refreshing fragrance. The diffuser works silently and shuts off automatically. It is constructed with a sturdy plastic and is absolutely BPA-free, i.e., there are no toxins. It has a dewdrop shape along with multicolor LED lights. The LiteMist ultrasonic aromatherapy system quietly spreads essential oils all over your space. It is a midsized diffuser, which is 7.1” x 4.2”. This size is perfect for any kind of indoor space at home, office or massage parlor. The reservoir can hold up to eight milliliter of water. It is highly energy efficient and runs for up to four hours before one needs to refill it. It has an auto shut off feature, which ensures the safe functioning, even if you forget to shut it off. ZAQ Dew is made up of healthy and safe materials and is free of any kind of toxic. The design of the diffuser is compact and sleek. The best thing about the diffuser is that, just by adding a few drops of essential oils and refilling the reservoir, you can enjoy the fragrance for about four hours at a stretch. It is highly safe, as it turns itself off automatically once the water just runs out. It is easy to use and can be simple to maintain. As the color of the power light remains quite bright, even if you turn it to no-light mode. Thus, those who prefer total darkness while sleeping, might face problems. The water reservoir cannot be removed and thus, you it becomes difficult to wash it. 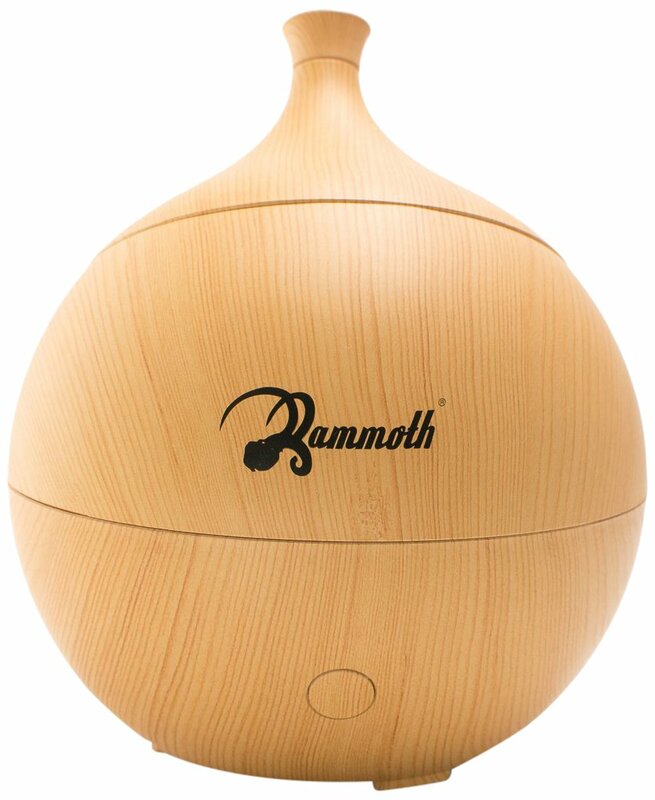 Mammoth Allie ultrasonic essential oil aromatherapy diffuser is easiest and most convenient to use diffuser. 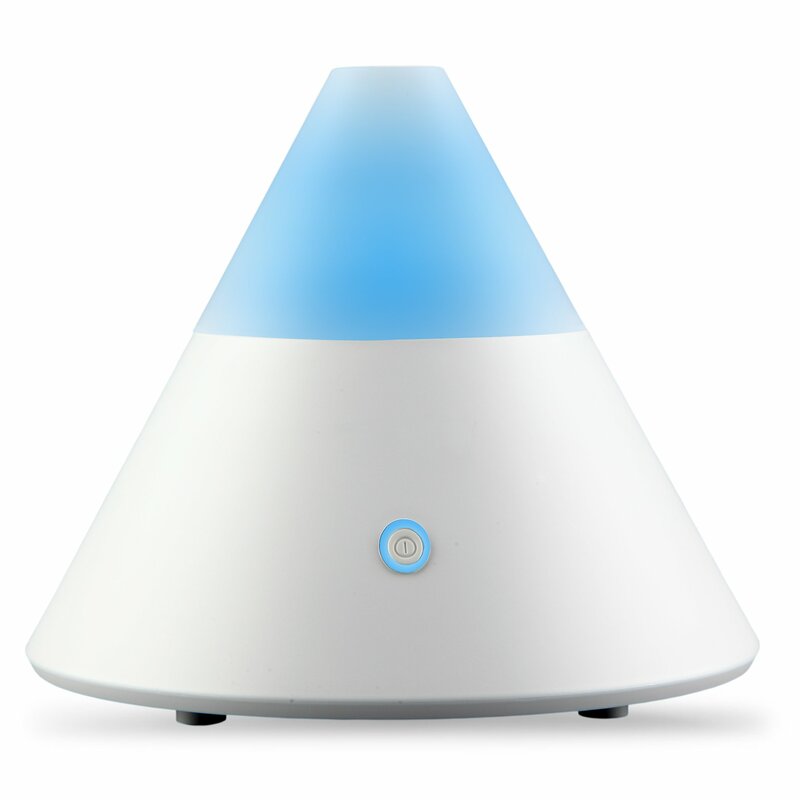 The diffuser uses a high quality ceramic ultrasonic diffusion. It is very easy to use. You will not require to turn, twist or tumble with the diffuser can simply change the water in the reservoir and add a few drops of essential oil, just by lifting off the top lid. It is the most easy to use and easy to maintain diffuser in the market. You can simply use it by plugging the power and switching it on and off. Its eco-friendly wood print and durable plastic material has created a wooden or bamboo look. It can run for three hours at a stretch before you need to refill the water reservoir. It is very easy to clean, use and put away. This diffuser is constructed with eco friendly wood print on very durable plastic which generally goes on and on for years. reservoir can hold up to 135 ml of water. If you let the Mammoth Allie run constantly and it will last about three hours or you could even let diffuser mist at regular intervals to allow it to last for six hours. The diffuser is made up of a durable ultrasonic ceramic diffusion plate, which will make a finer mist diffusion for your aromatherapy. It offers a 100 percent satisfaction money return guarantee. This product includes one year no-question replacement warranty. The vapor is cold and thus, the oil does not degrade as fast. It gives you two options, where you can either run it continuously or at intervals of two to three minutes, if oil gets too strong. It is very easy to use and is available at a great price. Even though the design looks great, it is actually difficult to open up at first and also hard to handle. It is most effective in the smaller rooms only. ZAQ Noor Diffuser helps to create an environment that is fresh, revitalizing, and bacteria-free with a soothing scent. The base of the diffuser is white and the cone shaped upper part comes in lime green, peacock blue, and pink. The upper portion glows with soft, long-life LED lights, or you can even turn off the light if you wish. The Litemist disperses the aromatherapy into your space very quietly. The diffuser is medium sized at 5.9-inches tall by 5.0-inches wide. It is the perfect size for a living room, bedroom, child’s room, office, spa, boutique, or salon. You can easily operate it, as there is a single on and off button. The ZAQ Noor is completely BPA-free, there are no toxins in its plastic body. The top portion glows with soft LED lights, or can even be turned off, according to preference. 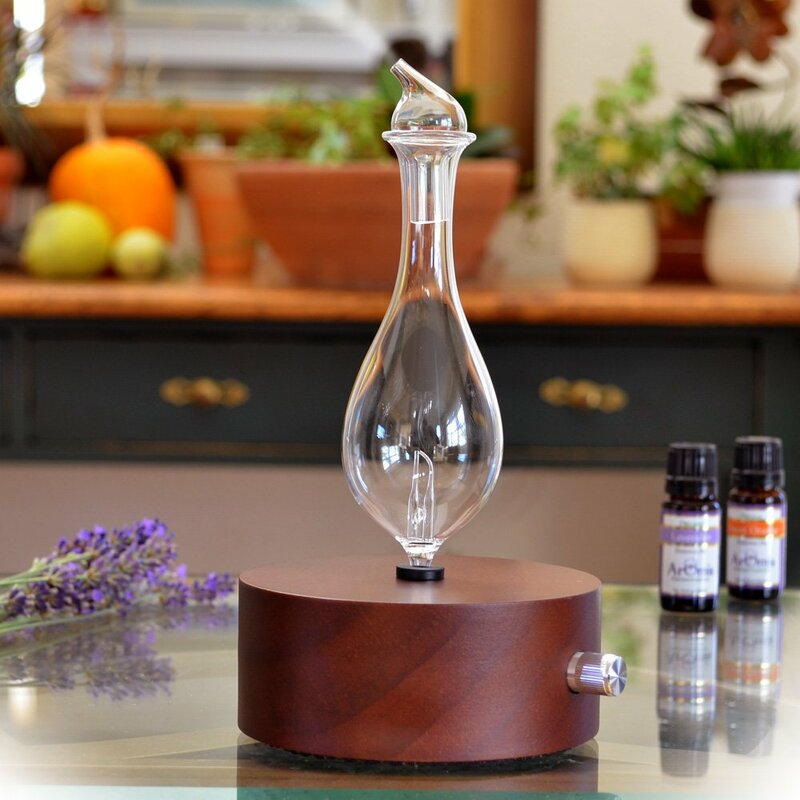 The LiteMist aromatherapy system spreads essential oils on your space, very silently. It is medium sized and is just big enough to fill up a small yoga studio, large living room, office cubicle and even an open foyer. Thus, you can welcome people with fresh scent, almost about anywhere. The system is energy efficient and its eight milliliter capacity machine can work for up to four hours at a stretch, before needing to be refilled. It has an auto shut off button, which ensures safe operation, even if you forget to switch it off. ZAQ Noor is made of safe, healthfriendly materials and is free of toxins. The product is extremely safe, as the safety sensor turns it off, when water levels goes down. It is highly energy efficient and can spread the fragrance for five hours at a stretch. The system is dual voltage, with the voltage ranges from 100 to 240 Volt AC. You cannot really turn off the power light completely and you can only dim it. So, it might prove to be distracting, if you are trying to relax or meditate. It will help to revitalize and refresh your body, mind, and soul. You will just require to use a few drops of favorite essential oils, or fragrant oils, along with tap water. The cool vapor will uplift your mood, will help to cure colds, flu, sinusitis, and a dry cough. The QUOOZ Lull has a beautiful design. It has a long-life LED light, and it comes in tangerine, French gray, celery green, rose, and aquamarine colors, which adds to the visual delights. You can refresh your home, living room, dining room, bath, child’s room, office, spa, boutique, or salon with the QUOOZ Lull. It has an added safety feature, where the whenever the reservoir holding water reaches lower levels, the unit automatically shuts off. It is also highly energy efficient in nature. It offers the most advanced and effective method of diffusing tap water with a few drops of essential or fragrance oil, using an ultrasonic aromatherapy technology. It has an ultra high capacity and can hold up to two hundred milliliter. Thus, makes for longer diffusing time and can operate up to a span of eight to ten hours. Its auto shut off feature adds to the safety, energy efficiency, and peace of mind- especially for use at night. The cover just sits on the base, fitting perfectly. It does not need to be screwed or clicked on and it makes for easy refilling and easy operation. The item does not leak when in operation. The user is not supposed to open the cover when item is in use. If the user does, water may leak all around. You can adjust the light, as per your preference. You can be turned off entirely, or can be even set to “breathing” a mode, i.e., lighting up gradually and slowly fading down. This specially assists in the meditation or therapeutic breathing. It is very easy to keep it clean and long lasting. It can operate for up to eight to ten hours. You will have to be very careful while removing the lid to refill, otherwise the condensation drips all over. The aromatherapy diffuser is made up of natural pine wood and hand-blown glass external components. It has no plastic parts and thus, it does not get damaged when it comes in contact with the oils like most other diffusers. Thus, with proper care, your diffuser can last for many, many years. This unit has a built-in timer function that runs in six ten minute cycles turning on and off every ten minutes then shuts down after sixty minutes. This timer is ideal for the users who does not always remember to shut it off. It is not only suitable for you home and office, but, also perfect for spas, yoga studios, massage studios or normal users who want their 30′ x 30′ space filled with great oil aroma. It has a heat free cold vapor. The heat or water used preserves the healing nature of the essential oils. All natural glass bottles and wood base are used. The aroma intensity can be adjusted. The fragrance can fill up a small space or up to a 30′ x 30′ area. It has the special built-in “10 on / 10 off” timer function along with the auto shut-off feature after four hours. It has a long product life expectancy and is also very easy to maintain. It enables you to program it to run for one to eight hours. As it is made up of natural materials, it lasts for several years. It might be considered to be a little noisier than most of the other products. It’s a little higher on price. There are many diffusers for essential oils in the market and most of them are very effective and has great amount of therapeutic value. But, none of the machines can be absolutely perfect. So, weigh the advantages and disadvantages carefully, before buying the perfect diffuser for your space.